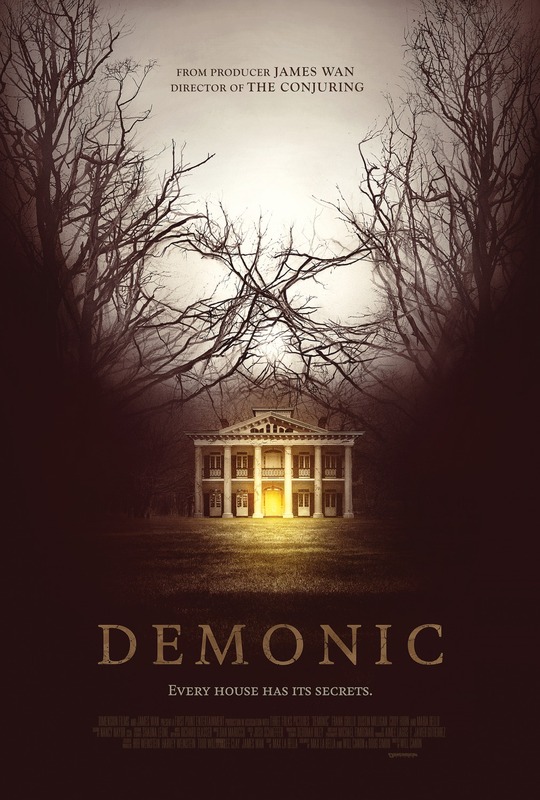 Demonic (2015) | Every House Has It's Secrets. This movie has been on my watch list for the longest time and I finally got around to watching it, kind of wish I didn’t wait so long. The cast and the script were pretty solid with this one unlike a lot of the movies I usually watch. The movie starts out with us learning about deaths at a mansion and then we zoom to present day where we bounce back and forth from present to a few hours/days prior. A group of ghost hunters and a man with some weird connection to the house take a trip there to investigate and to see what the man is so linked to. The movie then jumps back to the present where an officer was called to the house for someone trespassing and when he gets there he starts to discover bodies throughout the house. He ends up finding the man alive and he panics and tries to run away but ends up just falling down the stairs. The officer finally detains him and the man informs us his girlfriend and one of the ghosthunters are still missing and he believes the ghost hunter has kidnaped his girlfriend. The officers find hard drives and start to go through them as the man starts to tell us what happened throughout the night. Reading my little review the movie probably doesn’t sound all too interesting but you really should check it out. Is worth your time.